A selection of maths worksheets and PowerPoints dealing with drawing graphs of algebraic functions. 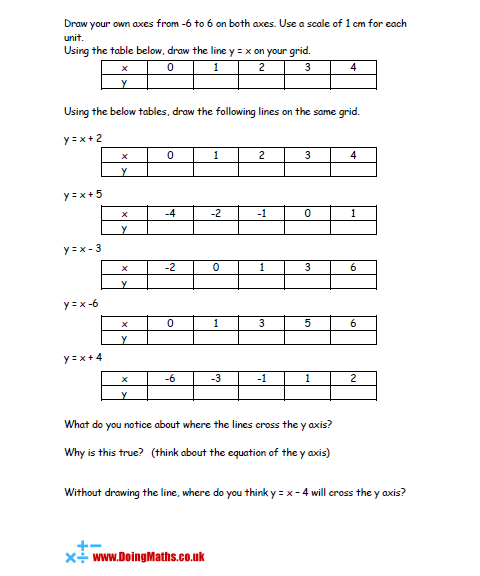 An introduction the gradient of straight lines, this worksheet gets pupils thinking about what happens to the line when you change the value of m in the equation y = mx. 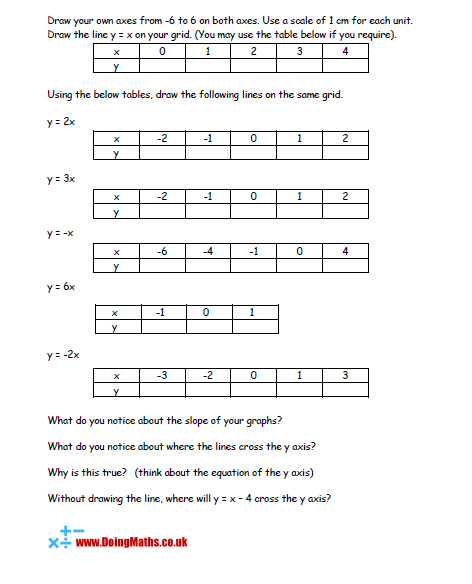 An introduction to the intercept of straight line graphs, this worksheet gets pupils thinking about what happens to the line when you change the value of c in the equation y = x + c.
An introduction to lines of the form y = c.
An Excel sheet set up to be used as graph axes on a Electronic whiteboard or data projector. An Excel sheet which when printed will give 4 small grids per page, to be cut out and handed out for a quick start to a graph drawing lesson.